Smart BRANDING SOLUTIONS for mODERN brands. We are creative branding agency in Ahmedabad providing solutions for product packaging, corporate identity, print, web design branding and strategic brand communications. A brand value is not a design or tagline but a perception that people creates out of your brand impression. At Brand Core Media, as a leading branding company in Ahmedabad we help our clients to create a perception for their brands. We are fresh and innovative brand strategist in Ahmedabad. From Ahmedabad branding studio we proudly cater global branding requirements for large business houses as well as startups who like to trust the great power of effective branding. We are Ahmedabad branding agency determined on building brand strategy which we execute across all mediums including print, outdoor, web and motion. Our creative Ahmedabad branding and graphic design services helps to make your product positioning innovative and memorable with presentable visual identity. 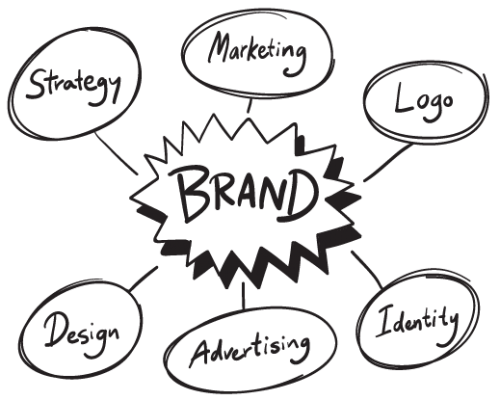 We are also a professional brand strategy planner and digital branding comapny in Ahmedabad offering various services. Our multidimensional graphic design and creative advertising capability and strength to analyze problem, target audience and market trends helps us to build business for our clients and achieving their financial goals. Based in Ahmedabad, Brand Core Media cherishes happy partnership with clients of all sizes and diversified business perspectives for brand design and building their brand reputation. Logo Designers Ahmedabad, Brand Core Media brings you the most affordable and creative design solutions that help your brand stand out from the clutter and merit it’s rank in limelight. Whatever may be the product, service or customer class you are targeting, our specialized and customised logo design Ahmedabad services will work for you. Our logo design agency works in a way where professionalism, creativity, client satisfaction and design works in a way you want. Whether you are starting a new venture or looking to redesign your current brand identity, we can create a brand new logo that is impactful and memorable for your customers. After all as a leading corporate branding company in Ahmedabad it is our prime focus for our client to have their first foot right. There is an increasing voice that print communication is about to die due to electronic and social media promotion, however the right and oldest form of marketing and branding through print publication is here to stay and will perish in future. After all it caters the largest percentage of audience without any doubt. We as a branding company in Ahmedabad design, develop and print marketing collaterals for your incredible brand like brochures, product catalogue, folders, reports, presentation, newsletters, direct mailers and booklets. Our specialist brand consultants knows how to harness the effectiveness of print through design and innovations. We at Brand Core Media craft exceptional print communication that offers long lasting impressions with customers. Naming a brand is harder than naming your own baby. And we do agree at branding agency in Ahmedabad that it is more difficult and it does create lots of trouble if you go wrong at first step. Brand names carries a specific perception and message with it. Also it comes with lot many questions like does it signifies the USPs we want to communicate? Does it suits the right set of customers we are targeting? Does it be more memorable for re-marketing and second purchase? Does it sound familiar to our clients? And many more. Also the right brand name helps your product to get out from clutter and stand alone in competition. It will also give you an importance by fostering the word of mouth publicity. As a strategic brand naming and brand design agency in Ahmedabad we answers all these questions with best of short, sweet and memorable brand name. CREATIVE BRAND DESIGN THAT SPEAKS FOR YOU. Creating powerful brand identity is our passion. Our act is pure, conceptual and creatively based on custom requirements. We create, develop and redefined brand identities in Ahmedabad for logo design, brochures and marketing collaterals, print advertising, animations and product packaging. Our brand design services come with great customer experience. We are result driven social media branding company in Ahmedabad. We are digitally focused and fully integrated brand agency working with some of the top brands and businesses for creating positive social media reputation, managing ad campaigns on Facebook, Twitter and YouTube and generating awareness and engagement through content marketing. We provide branding services for corporate animation, corporate video films, multimedia presentation, industrial films, product presentation and training video. We work with an aim to help your brand to communicate effectively by organizing your business information and integrate it with marketing and communication tools. CORPORATE ANIMATION FOR TALKATIVE BRANDING. We strongly believe that brochures are one of the most important selling tool any brand can ever use. It can be easy, communicative and engaging and with digital revolution, it can be easily shared also. Effective brochure design as a branding solutions offers long lasting connections and brand representation at every level of advertising. At Brand Core Media, as a leading branding company in Ahmedabad always suggest that a good brochure design is never a luxury but a necessity, or essential for any brand. A good graphic design can be perceptible, engaging and handy. There are many reasons to pick us for your company’s brochure design task. We understand that the design of your corporate brochure can have a big impact on its impact and attracting new inquiries. By accepting this core fact, our graphic designers and creative branding professionals create professional looking product brochure that surpass the creative expectations and results the same when compare for your sales goal. If your product not moving from the selves of the shopping mall or retail outlet then your packing needs to be blame for. Not only good packaging design help brands to stand out from the clutter but it also creates positive brand recognition and sales appeal to the customers. At Brand Core Media, we make sure your product message with USP come through in all aspect while designing packaging for your product. From a bottle wrapper to box sticker, bottle design to custom cartons and even goody bags, we design unique and effective packaging that carries product values with it. There are many big things that small industries and brands with limited budget can do online with proper website branding. Our website development with other technical services including UI development, web marketing process and online branding helps organizations and brands to achieve desired goal through their website. A proper strategy through website branding and online marketing agency can help you create correct identity that is must for initial launch. While planning for your website branding and online marketing solutions we care for some of the design basics like brand relevance, how it appears on web, colors, content, and consistency with maintaining your brand reputation. Hey! Are you looking for branding company in Ahmedabad? Having dissimilar and well defined brand story sets your product apart from the crowd. At Brand Core Media, Ahmedabad we believe that good is not good enough if it is not performing and getting success to attract customers. We research well for defining brand strategy and integrate abstract idea with creative art. At our Ahmedabad branding studio we work with a team of well talented designers and branding experts to aid your product or service for creating aesthetically individual, stable and resourceful brand. Our approach for brand strategy and market research have given us instrumental results for creating outstanding results. Our system helps organizations and individuals to create powerful, cohesive and competitive brand from which the business can grow and break new competitive grounds. We help you to express your brand thorough logo design, creative graphics, brochures and marketing collaterals designs, website design, social media branding, corporate animation and product movies.